WARNING: Not for use on chrome plated plastic or chrome plated aluminum. 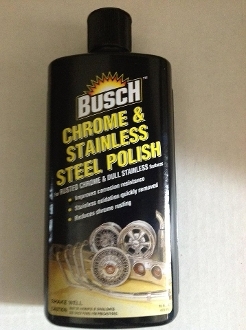 For cleaning stains or brake dust use Busch Chrome Wash.
For removal of rust from chrome and oxidation from stainless steel. Restores shine to both surfaces and fights return of rust on chrome. Removes stains and rust from chrome plated and stainless steel. Provides protective film against rust and elements. Can be used with buffing pad.